Cost: Average cost is £40 per person, not including drinks or service. From the à la carte menu, starters are priced from £7.50 to £12, tandoori dishes from £12 to £16.50, and mains from £15 to £20. Biryanis of king prawn, lamb or chicken are priced at £18.50 to £21. There are two, three-course set menus: the Maharaja Feast (£30) and the vegetarian Maharani Feast (£27). About: The Gaylord Restaurant in London opened in 1966, and in 2016 celebrated its 50th anniversary. Said to have the first tandoor (charcoal clay oven) in London, it still serves the same fragrant fresh breads and kebabs, Indian and Punjabi fare it did at the height of the Swinging Sixties. Photographs of George Harrison and Peter Sellers posing with restaurant staff in 1966 are on proud display in the restaurant’s entrance. The 1966 menu is still available for diners to see, and it was a shock to see that portions of chicken tikka masala were priced at 30p, and lamb rogan josh at 40p! 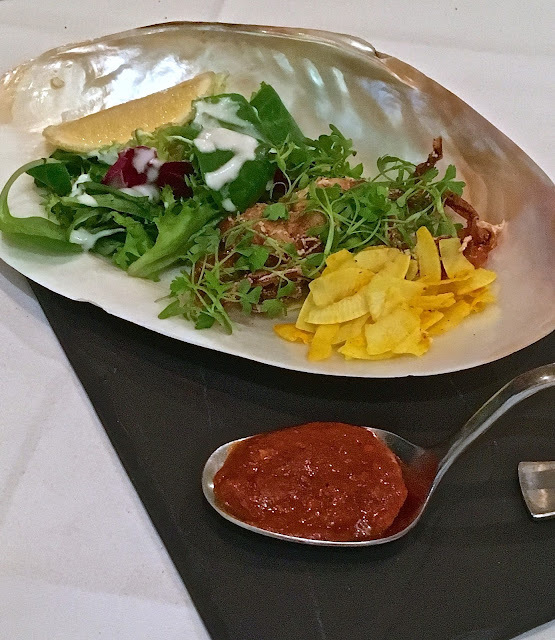 The Gaylord Restaurant is an elegant establishment in the heart of Central London, serving both traditional and modern Indian cooking to a varied clientele of locals, shoppers, families and tourists. The mid-week evening we were there, the restaurant was nearly completely full. What We Ate: We started with a few delicious golgappa shots (£6.50) – fresh and spicy little pani puri, these are round, hollow puri fried crispy pastry shells, filled with a mixture of flavoured water and fillings like tamarind chutney, chili, chaat masala, potato, onion and chickpeas. At Gaylord, they are served over shot glasses of chilled herbal infusion. The murg gilafi seekh (£8.50), fragrant portions of minced smoked chicken topped with bell-peppers and chargrilled on skewers, were delectable. Tandoori tiger prawns (£10) were jumbo-sized and succulent, having been marinated with saffron and Indian spices, then grilled in a clay oven. In a departure from the original 1966 menu, Gaylord now offers Mexican tacos with an Indian twist. We had the spicy rajma (kidney bean) taco (£7.50) – jauntily served (recalling the colours of the Indian flag) on a gold, green and red toy wire car. Still on the starter menu, we were tempted by the pao bhaji (£10) - soft buttered buns with mashed potato, vegetable curry, chopped onion and coriander, capsicum. Served in a fondue pot, these were delectable. Crab cake dakshini (£11) came with a generous amount of meat, deliciously flavoured with curry leaves, aromatic Indian spices and mustard cress. The lamb chops Anardana (£11), served on a sizzling plate, had been marinated in spices and pomegranate juice, then charcoal grilled to give an irresistible smoky flavour and aroma. The Makhani Paneer (£11.50), dating right back to 1966, combined cubes of fresh cheese made on the premises, simmered in a creamy tomato sauce. I could see why this had lasted the duration – simple, good quality ingredients, delicately cooked and well presented. Equally good was the soft shell baby crab (£7), in light batter with spicy Goan masala. This came with slices of toasted coconut (a combination I thoroughly enjoyed) beautifully served in a large seashell. 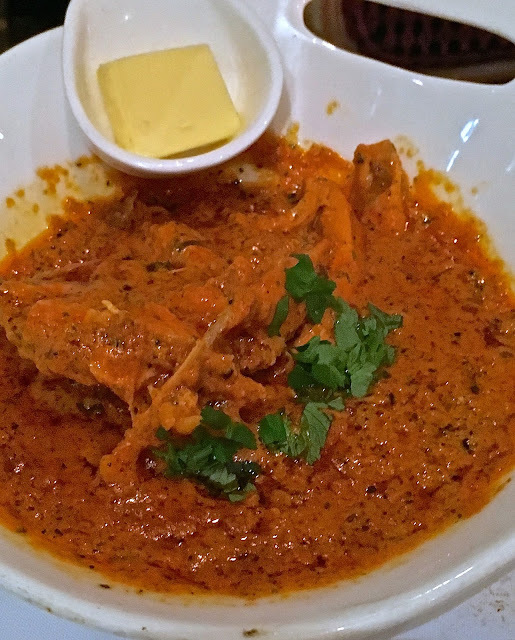 Gaylord’s butter chicken (£16) was a lip-smacking classic - a deboned tandoori chicken, cooked in a tomato-based sauce enriched with butter and double cream, flavoured with aromatic herbs and spices, including one of my favourites, fenugreek. Lamb shank (£19), came meltingly tender, delicately spiced and served with a subtle onion and tomato curry. The fish tak-a-tak (at seasonal price) was a whole grilled fish, filleted (tilapia on the day we were there) and spiced with mustard seeds, curry leaves, red chilli and caraway seeds, served in a tin-lined copper pan. To accompany, we had a paratha (£4), a piazi kulcha (leavened bread stuffed with onion and coriander, £4.25), and basmati rice (£6), cooked with lemon, mustard seeds and curry leaves. Best of all though was the house speciality of dal bukhara (£9.70). This had black lentils slow-cooked for 8 hours over charcoal, and was deliciously rich and creamy. For dessert, the carrot pudding - gajar ka halwa (£5.50) blended a hot, sweet carrot pudding with pistachio slivers. The gulab jamun (£9) had fresh cheese spheres, deep-fried and served with a delectable sugar syrup laced with spiced dark rum, flambéed. What We Drank: Cocktails are priced at £9 to £12. The entry level wines, both white and red, are Beaujolais from George Duboeuf, Le Bouquet de George, priced at £19.90. Indian Kingfisher and Cobra beers are also available. We were keen to explore the range of Indian wines which Gaylord has just launched under their own label, all from Akluj in Maharashtra. The house sparkling white wine, a Fratelli Grand Cuvée Brut NV, Chenin Blanc (£35) was very well made - bone dry, with refreshing citrus acidity and minerality. 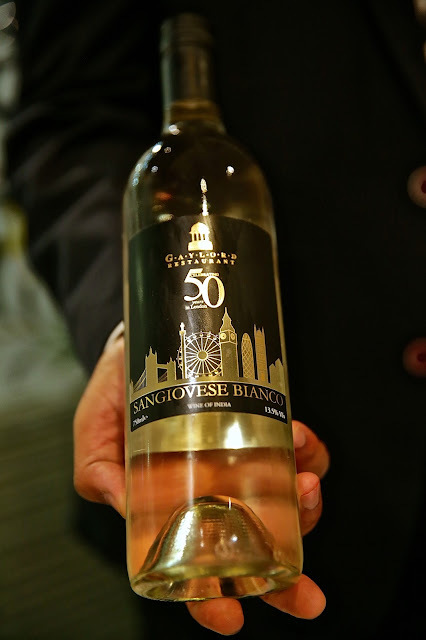 The Gaylord Sangiovesi Bianci (£36.50) was palatable and off-dry, but for my palate lacked complexity. Better was the Gaylord Fratelli Sangiovesi red wine (£36.50) - fruity and well made, when enjoyed with the restaurant’s spicy food, the cherry fruit and sweetness were accentuated. 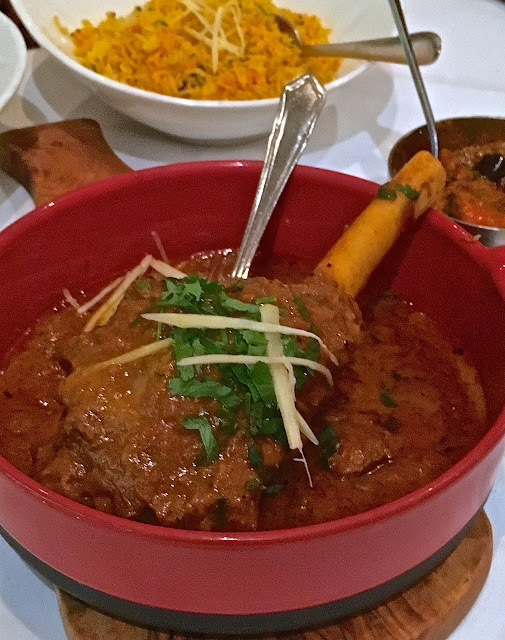 Likes: There were so many highlights in this meal – the tandoori lamb and prawns, the paneer, the whole tilapia, the meltingly tender lamb shank and the carrot dessert were all excellent. Verdict: With a 50-year history, there are few restaurants in London that have stood the test of time as well as Gaylords. But this is no surprise - the classic Indian dishes are hard to fault, while service is friendly and well informed. I would love to return to Gaylord soon. Highly recommended.